With the new year upon us, I thought many of you will be looking for food pantry organization ideas that won’t cost you a fortune. 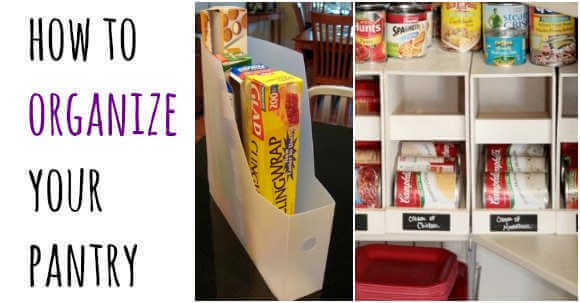 Find 17 easy pantry organization ideas that are budget friendly and easy to do. How are you getting organized? I have so many different ideas for my home. One of the things I tackled last year (that I still am constantly working on) is food pantry organization! Does anyone else struggle with food pantry organization on a regular basis? Ours is much better now, but it requires constant upkeep. With so many little hands going in and out of our pantry, I have to stay on top of it or it will get out of hand quickly. These kitchen pantry organization ideas will save you money! If you have an organized pantry, it is much easier to know exactly what you have and need on your next grocery trip. It is so easy to over spend each week on your grocery bill when you can’t find what you need. I can’t tell you the times I have purchased an item only to find out I already had two at home but they were hidden in the pantry. 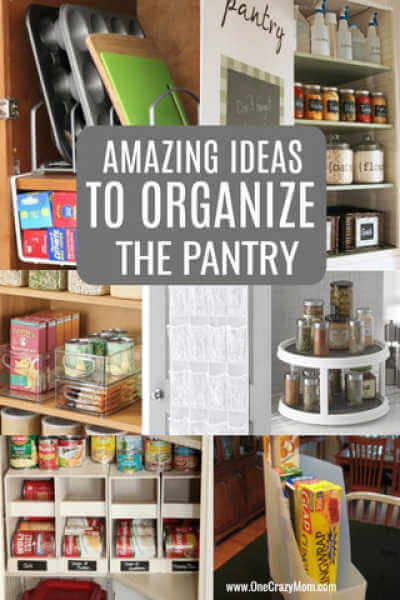 Let’s get organized with easy pantry organization. Since we talked abut what is a stockpile and why you need one, I thought today I would show you creative ways to organize your pantry. Stay organized is KEY to saving money. Once you get started and do the initial work, it will be much easier to keep everything organized. We use lots of bins and containers to keep items groups together by category and similar items. Think outside the box and use containers you might already have at home. How can I keep my pantry organized? Getting things organized is one thing but keeping things organized is an entirely different task. I find that doing a weekly check of the pantry really helps. If you find things out of order or need to refill an item, it is an easy fix when checking weekly. Use containers for little items that might get lost or tossed around. By keeping tabs on things on a regular basis, your pantry will stay in order. Don’t wait or you will become overwhelmed! How do I organize my pantry dry goods? Cereal containers are perfect to keep track of cereal and you will always know how much you have left. Another idea is to use glass jars in the pantry. These are perfect for oatmeal, sugar, beans, rice and other dry goods. If you are curious about how to organize your pantry, here are some pantry organization hacks. Get started today and you will love having an organized pantry! There are a lot of different things you can do in your pantry to organize it, but one of the items I recommend everyone have is a label maker! I got mine several years ago and I don’t know how I ever organized without it! 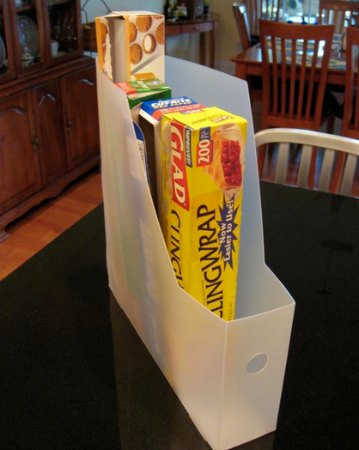 If you have boxes of cling wrap and foil and baggies all over the place, try using a magazine rack to keep them all organized. One rack is big enough for a handful of items to be stored. If you are short on shelf space, you may even be able to hang this on the back of your pantry door. Chica and Jo did this and I just think it is such a smart idea. 3. Shoe Organizer used as pantry door organizer. In the pantry? Yes! I have seen people place an over the door shoe organizer on the back of their pantry door. You can easily store and easily access individually packaged items like kids’ snacks, cleaning supplies, seasoning packets, and MORE in the pockets meant for shoes. This is a great space saving idea for a small pantry and I really think you will love using this over the door pantry organizer. Head on over to Pinterest where you can find a TON of great ideas to utilize storage space in your kitchen pantry. I saw these great can organizers and luckily a neighbor friend of ours made them for me. They make such a huge difference in my pantry! Cans will overrun a pantry if you aren’t careful. I love using can organizers for two reasons. 1) They keep a specific type of can all in one place and 2) I know I am always using the oldest can I have. If you don’t have a can organizer, it is easy for some cans to get lost in the background. Baskets are a pretty way to add some color and texture to your pantry. 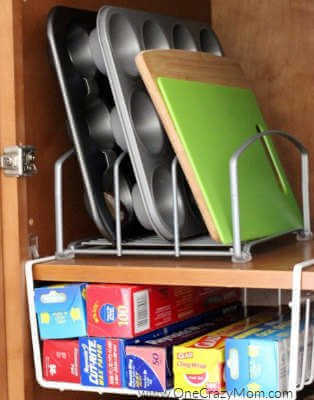 They are also great at storing things that don’t sit well on a shelf without help – think pasta and marshmallows. Since baskets come in all shapes and sizes, you are bound to find what you need. Remember to measure your pantry shelves well before you buy anything. I like to shop on Amazon, but I’ve also found my local Home Goods store has a lot of nice basket options. One of the other things I like to use in my pantry is clear bins. There is nothing worse then looking in the pantry and not knowing where anything is. Yes, baskets are pretty, but I think they should be used in moderation. Clear bins are practical because they keep all similar items together and they keep things easy to find. We use bins to store snacks like granola bars, fruit snacks and more. A lazy susan is great to have in the pantry! You can use one to store your spices or to store your cooking oils. You won’t have to worry about not being able to find that bottle of olive oil. Just place all of your oils and other cooking supplies on your lazy susan and spin it until you find what you need. I know I talked about a label maker earlier, but if you are all labeled out or just don’t want to go that route, why not try chalkboard labels? These labels come in a variety of pretty shapes and can be applied to a variety of surfaces to keep your pantry organized. Now I know most cereal comes in boxes so they fit in your pantry fine, right? Well, how do you keep track of how much cereal you have left? With clear cereal containers, you can keep track of how much cereal you have left so you don’t have kids screaming at you first thing in the morning that you’re out of their favorite cereal (this is not fun). Plus, if you buy cereal that doesn’t come in boxes, you’ll want some cereal containers because they’re easier to store then bags. If you have an empty wall in your pantry, consider putting up a chalkboard wall. You don’t even need to paint. You can stick a Chalkboard vinyl peel to a wall (or even the back of your door). This would be very handy to keep your grocery list on, so you know when you are running low on your stockpile. I have seen people use glass jars in their pantry. They look very classy! I don’t do these in mine because I’m afraid of them breaking, but if you do go this route, make sure you get glass jars with air tight lids. You don’t want your foods spoiling. Great things to store in glass jars include rice, beans and other dry goods. 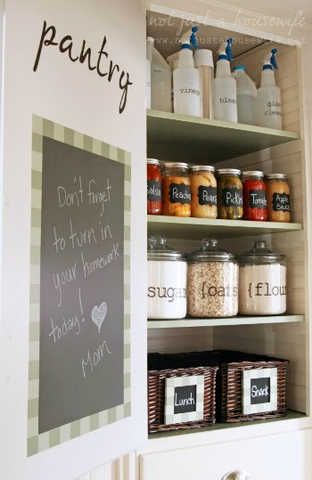 In the picture above, you see that Not just a housewife is using glass jars, chalkboard labels, bins and chalkboard. All that I have recommended so far! Isn’t this beautiful?! If you are short on shelving in your pantry, you might want to consider adding more shelving like these wire shelves. These are easy to install and come in a variety of sizes. It is great because sometimes standard shelves are too far apart. Small plastic desk organizers are great for keeping small things together in your pantry. I like to keep Kool Aid Packets and tea bags in these small plastic organizers. You can find them on Amazon, but I think I’ve seen something similar at Dollar Tree, so its worth having a look there, too. If you are keeping chips in their bag, you might be in need of more chip clips (we never seem to have enough). You can order some online, but I read recently where you can break off the end of skirt hangers and use the clips to close your chip bags. This might not be the fanciest looking chip clip, but it is definitely frugal! Extend the amount of “shelf space that you have by adding hanging racks below your shelves. I wouldn’t put heavy items in these hanging racks, but they would be great for pasta or snacks or bread, to name a few. This is a great idea for a small space to keep your pantry organized. Mesh pencil holders make great spice racks! All you need is a little bit of wall space and a handful of these mesh pencil holders and you have yourself some instant spice organizers. I love that not too many spices fit in here at once so you can see everything you have. These can be screwed directly into the wall inside your pantry. If you have a little more wall space in your pantry, consider hanging a mail organizer. This would be nice to store snacks or even prepared hot cereal packets. What do you have in your pantry that you could store in this? What about paper goods like plates and napkins? That seems to be a big question for most of us! 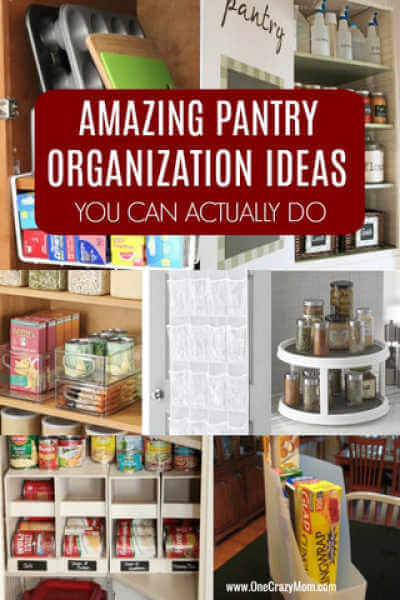 Hopefully some of these easy food pantry organization ideas will help you take the leap and tackle the pantry and keep everything in order. Just a word of warning before you start – you probably want to make sure you have a good deal of time carved out for this task. It may take you a little longer then you think. 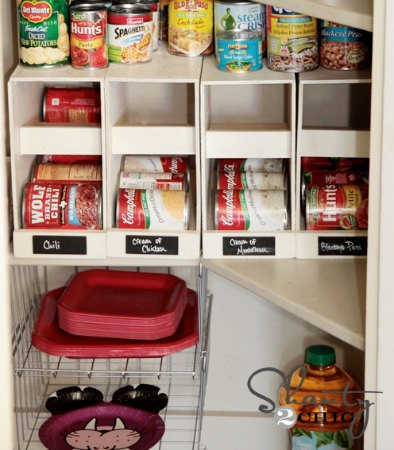 From small pantry organization ideas to walk in pantry organization ideas, you will be off to a great start. However long it takes, food pantry organization will be worth it! I promise. Take the new Year and get organized with these easy organization ideas for awesome pantry makeovers. Good luck and happy organizing with these kitchen pantry space saving ideas! 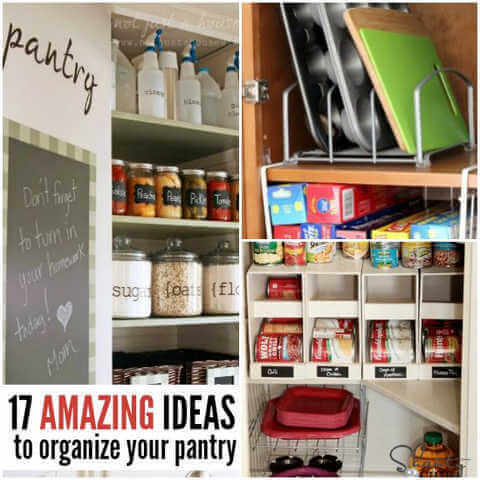 No need to look for pantry organization ideas pinterest when there are so many easy pantry organization diy ideas right here! Let us know how your pantry turns out.